Nuro's first product is its self-driving vehicle design for goods transportation. 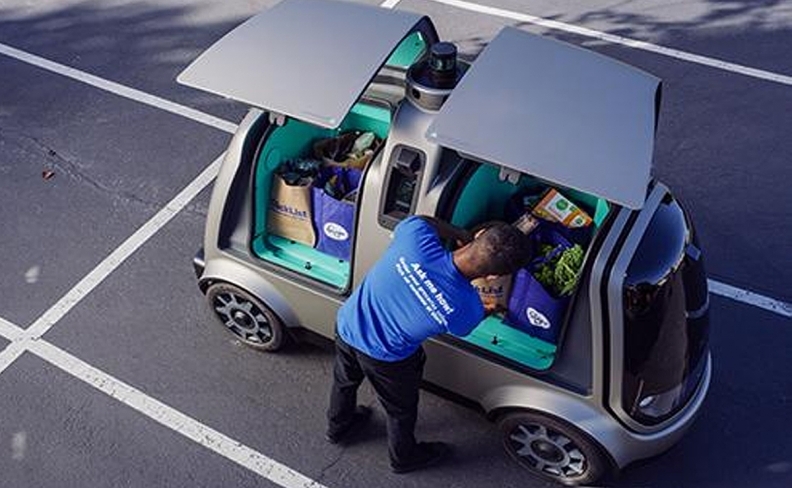 Autonomous vehicles and America's largest supermarket retailer are teaming up to change the future and convenience of grocery shopping. Kroger and Nuro, an autonomous vehicle startup, announced a partnership Thursday aimed at making grocery delivery accessible and affordable with a pilot test. Through the partnership, customers can place same-day delivery orders using Kroger's ClickList ordering system and Nuro's app, according to a Kroger statement. Orders will be delivered by Nuro's fleet of autonomous vehicles. The pilot is expected to begin this fall. Nuro's first product is its self-driving vehicle design for goods transportation. The Mountain View, Calif.-based startup, created by two former Google self-driving car project engineers, is only 2 years old but has already established itself as a technology company aiming to accelerate the benefits of robotics for everyday use. The partnership is Nuro's first project since emerging from stealth mode in January. Its initial fleet was six electric vehicles intended to carry only goods. This is unique compared to other autonomous vehicle projects, spearheaded by tech and auto companies such as Alphabet Inc.'s Waymo and General Motors' Cruise, that are working to provide an alternative for human transportation. According to Kroger, the Nuro car contains two compartments, and customers will be given an access code to open the vehicle's doors upon arrival. Nuro's hardware and software have not been applied and deployed prior to this partnership. Kroger will announce the pilot market soon. Kroger already engages customers in digital shopping through its data-driven Restock Kroger initiative. The Cincinnati, Ohio-based retailer covers 35 states and Washington, D.C., and has extensive operations through its supermarkets, multidepartment stores, price-impact warehouse stores and marketplace stores. It has also recently announced investments in online grocer Ocado, which it will use to build automated warehouses, and meal kit company Home Chef. The partnership is one way Kroger is working to get ahead of other grocery retailers' efforts in the autonomous delivery sphere. Amazon has ongoing investments in the grocery realm, especially with its purchase of Whole Foods. Amazon recently applied for a patent for an autonomous ground vehicle that could deliver items to a front door or inside a home. Walmart and Postmates announced an agreement in April to expand the retailer's Online Grocery Delivery option.